The perfect cart for healthcare, hospitality, dry cleaners, on-premise laundries, or coin laundry facilities with large capacity needs. 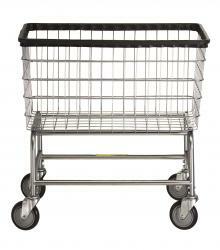 Comes standard with chrome basket and base. This unit is equipped with R&B�s proprietary 5" Clean Wheel System � the only caster that prevents lint and thread pick up. Total unit height is 32".